Our Extra Virgin Olive Oil “Duccio“ reveals the exceptional qualities of Tenuta Larnianone ‘s unique terroir and the harmonious affinity it holds with nature. Duccio is obtained by an exclusively mechanical cold pressing of the olives coming from the 1916 trees in the estate, some of them well over 100 years old. The olive groves where we cultivate Frantoio, Moraiolo and Leccino grow side by side, shaping the landscape just outside Siena. Harvesting is performed exclusively by hand, with pickers selecting only the best-quality fruit from each tree, thereby ensuring that the olives remain fresh and fragrant. Duccio comes with a deep green colour and a delicate aroma of enchanting fragrant herbs. The taste is straight and harmonious, with hints of almonds and artichoke, it has vaguely spiced and bitter aromas typical of olives harvested at the right ripening time. “Duccio” derives its name from the founder of the famous painting school of Siena which was established before the Renaissance. It comes in an elegant shaped bottle made with the unique silk screen printing technique that provides the bottle a distinctive feature. 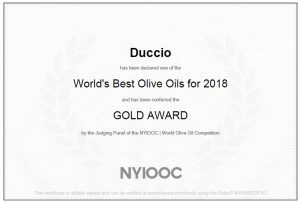 Duccio has been awarded with a Gold Medal at the New York International Olive Oil Competition, the most important Extra Virgin Olive Oil competition of the world. Duccio has been awarded with a Silver Medal at the Japan Olive Oil Prize of Tokyo, one of the most authoritative Extra Virgin Olive Oil competition of the world . 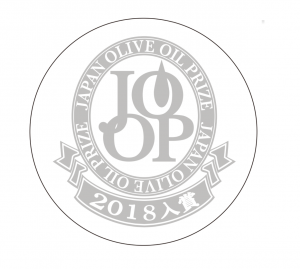 Duccio has been awarded with a Silver Medal at the Japan Olive Oil Prize of Tokyo, one of the most authoritative Extra Virgin Olive Oil competition in the world .